Mom and I are sitting at the hospital with Luke. It's his first trip. The circumstances for our trip could have been worse. Mom took the kids to the park today after Lunch to enjoy the great weather. While there Luke missed a step and fell head first into a pole. He came up bloody with a cut above his head. Papa took Alyce while I met Mom and Luke at the hospital. 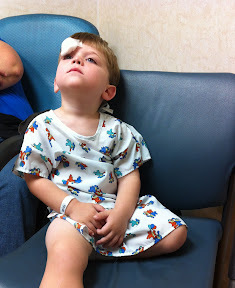 We are sitting in a room now waiting for some numbing agent to do its thing so Luke can get some stitches. 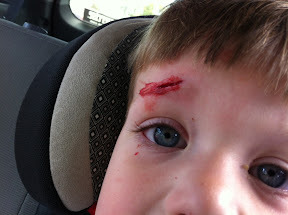 They aren't sure how deep the cut is but it might require multiple layers of stitches. Luke is being a real trooper this far. Especially since he is missing his nap. We'll see how well he does when the needles come out.